Sign Language major, Elizabeth says “It’s not fair,” about the increase price for parking at City College. Photo by Emily Foley. 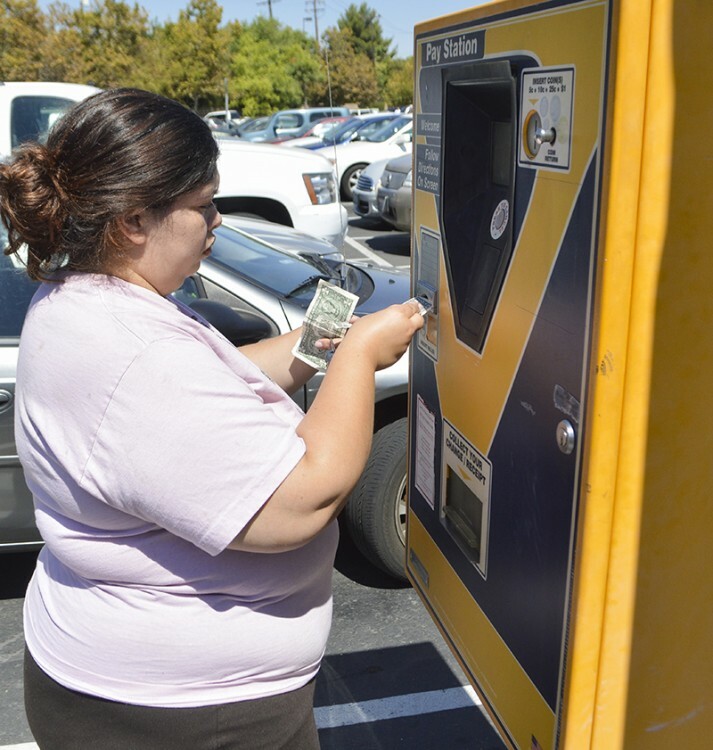 Los Rios students who drive to campus and pay to park in the student parking areas were greeted with a fee increase over the summer as the Los Rios Community College District raised the daily parking permit fee from $1 to $2 at all four campuses. The increase took effect July 1 and will be accompanied by increases to monthly passes beginning next year. According to district Associate Vice Chancellor of Communications and Media Relations Mitchel Benson, the decision to raise the fees was made at a May 14 district Board of Trustees meeting. City College Business Services Supervisor Robert Heidt said this is the first increase to parking fees since 1997, when the daily fee went from 75 cents to $1. “Historically, Los Rios has been very prudent with increases to optional fees, including student parking permits,” said Heidt. Benson explained that the main reason for the increase was to help maintain the parking structures and lots. Benson said there are more parking structures throughout the district and more to maintain than ever before. City College student Brandon Treadwell, business major, said he understands the importance of maintaining parking facilities, but he questioned the timing of the increase. “Well, we have to keep the structures in good condition, but, on the other hand, it’s a brand new structure, so it’s kind of odd that we’re having to increase now instead of when they were first building it,” said Treadwell. Benson pointed out that in addition to maintaining painted traffic lines, pavement and the daily operation of the parking areas, the parking fees also support campus police employees. According to Benson, starting in January, semester parking passes for automobiles and motorcycles, which are recognized across all four campuses, will also increase in price by $5. Semester automobile passes will increase from $30 to $35 and motorcycle passes from $15 to $20. Students who qualify for the BOG fee waiver will continue to receive a discount on rates for the passes. In June, summer passes will increase from $15 to $20 for automobiles and from $8 to $10 for motorcycles. In comparison, according to Sac State’s official website, parking fees are currently $165 for an automobile per semester and $41 for motorcycles. In the summer, Sac State students pay $110 for automobiles and $28 for motorcycles. Weekly passes run $11 and daily passes are $6. City College student Edgar Lozano, architecture major, said that he doesn’t think an increase in parking fees is fair to students. This entry was posted in News and tagged campus safety, City College, daniel wilson, fees, increase, los rios, parking, parking fees, parking structures, police, sac city, Sac City College, Sac City Express (SCC), SCC. Bookmark the permalink.